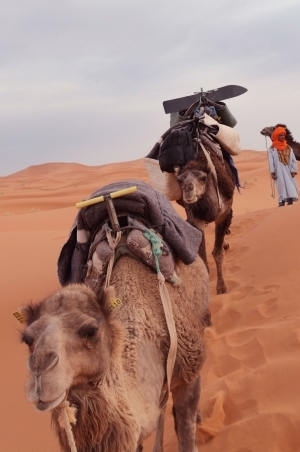 Jessica Huras downs a bottomless supply of tea, rides a camel and spends a night in the desert as she connects with the dream scene that is Morocco. I’m sitting in a wrought iron chair on a sand-covered terrace in the middle of the desert – and I mean, the MIDDLE of the desert. Just beyond the low, turreted wall wrapping around the terrace is a landscape of windswept sand dunes that stretches beyond the horizon. In the centre of the scene, framed by the dunes, are around a dozen camels kitted out with harnesses, ready to carry me and my group mates even deeper into the Sahara. We’ve just arrived at a basic guest house, where we’ve stashed most of our belongings in storage lockers, taking only what we’ll need for our overnight stay at a desert camp. It’s mid-afternoon in August, the most scorching hot month of the year in Morocco. We’re waiting for the heat to drop from peak intensity before beginning our trek, so we’re not zapped into vapour by the desert sun. Turkish Airlines offers direct flights to Casablanca’s Mohammed V International Airport from Toronto. 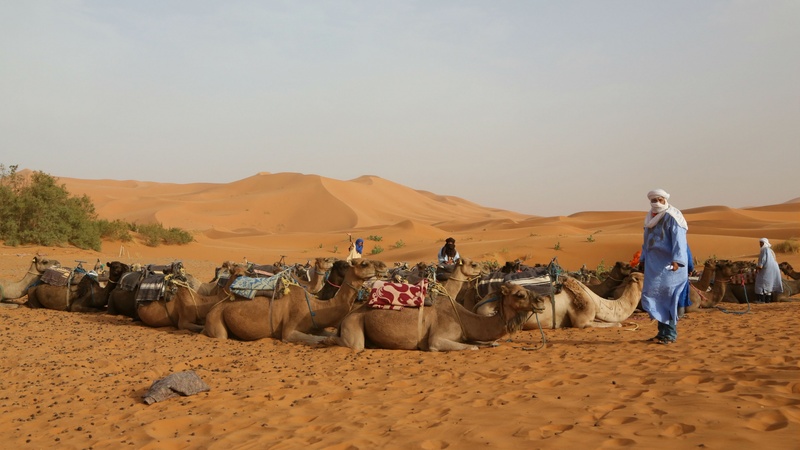 G Adventures’ Moroccan Desert Adventure; Morocco Kasbahs & Desert; and Morocco: Sahara & Beyond tours, which range in length from seven to 15 days, all feature an overnight stay in the Sahara. I’m sitting on the terrace of the guest house restaurant, drinking tea while I wait. 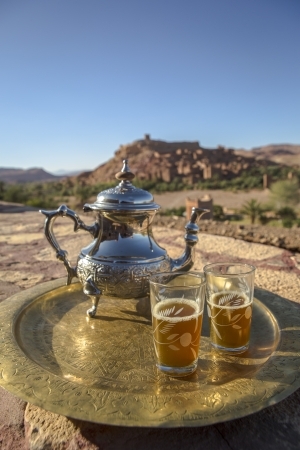 Ordinarily, a hot drink on a sweaty day would be a firm pass for me but it’s different in Morocco, where tea isn’t just a hot drink – it’s a way of life. There’s some disagreement among historians about exactly when tea was first introduced to Morocco, but it may have been as recently as the 18th century. Regardless of when tea originally arrived in the North African country, Moroccans embraced it fully and even put their own spin on it. Morocco became known for a particular preparation of tea: Green tea, steeped with lots of fresh mint leaves and sweetened with what I’m sure is far more than the recommended total daily intake of sugar. Tea is enjoyed any time of day in Morocco (and often many times throughout the day). Since arriving in Morocco less than four days earlier, I’ve already lost count of the number of cups of tea I’ve had. Servers bring it to our tables in restaurants without question, and it’s offered to us whenever we arrive at a new guest house. Tea is much more than a beverage in Morocco, the act of serving it to someone is a gesture of welcome and friendship. On the first day of our tour, our guide explained that relationships in Morocco are said to develop over three cups of tea: the first you are a stranger; the second you are a friend; and the third, you are family (this turned out to be a quote from a book called, appropriately, Three Cups of Tea). Morocco is a predominantly Muslim country and many locals therefore don’t drink alcohol. Tea, to a large extent, plays the role that alcohol plays in other countries – it’s a social drink to share with friends and to bond over. For this reason, Moroccans have wryly nicknamed tea “Berber whisky” (Berbers are an indigenous ethnic group). I slurp back the remainder of my tea as our guide signals that it’s time for us to meet our camels. I haven’t been on a camel since a quick childhood ride at the zoo and if you’re thinking (like I was) that a camel is around the size of a horse, you’d be very wrong. The closer we get, the more massive the camels seem to become. My camel is tall and wide – so wide that I feel like I need to assume a partial-splits posture to swing my leg over its massive, hulking body. Back at home before I left for this trip, I set my out of office message to a (what I thought was hilarious) GIF of a tourist falling head first off a camel. That once amusing image is feeling a little too real now. As you might expect, camels don’t exactly stand up or sit down evenly. Instead, their back legs come up first, thrusting the rider abruptly forward until the front legs straighten and even things out. A painful and embarrassing fall doesn’t seem like an entirely far off possibility if I’m not careful. Our guide encourages me to sit back in the saddle slightly, but I continue gripping the handle as if I’m riding a rodeo bull. Our group is organized into two slowly plodding convoys, each led by a camel handler. Most of my group mates are taking selfies (and one particularly ambitious pair with what must be the world’s best data plan is Facetime-ing their parents in Canada), but I’m sticking to my this-bull-could-buck-me-off-at-any-second approach to riding, clutching the handle so hard my fingers are starting to hurt. If anyone was going to try to take a selfie, drop their cell and have it get lost in a sea of sand or be crushed by a giant camel foot, it would definitely be me, so I’m not taking any chances. Judgement aside (because I’m definitely not above taking a good travel selfie), I also avoided pulling out my phone because this was one of those moments I wanted to be fully present for. Some iconic travel sites pale in comparison to your imagination when you finally see them in real life (I’m looking at you, TINY Stonehenge), but not the Sahara. The sand dunes look like frozen ocean waves, swelling up in some areas, towering over our heads; and receding in others to reveal an infinite horizon. The dunes seem to close in on the guest house behind us as we ride away, plunging us into complete remoteness. As evening sets in, the sand colour changes from a deep gold to a dusky, reddish-purple and the sun casts picture-perfect shadows of our camel-riding selves onto the dunes. When I’m heading into an unknown scenario in travel (and in life, for that matter), the adage of preparing for the worst but hoping for the best usually serves me well. So, when I was told before the trip that we were going to spend the night at a desert camp, I was fully prepared to be sleeping on a lump of sand under a thin tent. Our real desert camp turns out to be far more comfortable, consisting of a small group of sturdy textile tents, each with two twin mattresses. Traditional Moroccan carpets are layered between the tents to create pathways across the sand. We settle into our tents quickly, so we can follow our guide’s recommendation to hike up a lofty sand dune nearby to watch the sun set. Climbing the steep sand dune feels like wading uphill through molasses. My legs are already shaky and sore from being stretched across a camel for over an hour – and now I’m forcing them to carry me up a sharp incline. With every step, my foot sinks deep into the sand and it feels like my overall trajectory is downward rather than up. After a lot of huffing and puffing (and more than a few breaks), I reach the peak of the dune (or, to be honest, what I consider to be close-enough to the peak in my exhausted state). Fortunately, it’s high enough to offer a spectacular view of the cinematic sunset, as promised. As we awkwardly gallop and slide back down the dune, still battling the pull of the sand, one of our guides begins preparing a tagine over the campfire for dinner. Like tea, tagine has deep roots in Moroccan culture. The word tagine refers to both a meal (a hearty, stew-like dish) and the vessel that it’s made and served in. There are dozens of tagine recipes – it might feature lamb, beef, chicken or fish, mixed with a variety of different dried fruits, nuts, olives, fresh herbs and spices like cinnamon and cumin. A tagine vessel has two parts: a cone-shaped top and a circular bottom. The cone top helps to return moisture down to the food as it slowly cooks over the fire, which improves the texture of tough cuts of meat and results in a more savoury final dish. This cooking technique also minimizes the amount of water needed to cook the food, a key trait in areas where clean water is scarce. Further adding to the tagine’s brilliance as a piece of cookware is the bottom part of the dish, which can be carried from the fire to the table and used for serving. We sit under the stars on cushions set around low tables. Our guide removes the lid of the tagine to reveal a plate of tender veggies layered over succulent chunks of beef. I tuck into the tagine and sip a cup of tea which, as usual, was served automatically with the meal. I reflect again on what our guide said about relationships and three cups of tea. I don’t think it’s just the people I’ve met on this trip that I become closer to with each cup – it’s Morocco as a whole. Countless cups of tea later, Morocco no longer feels like a stranger.